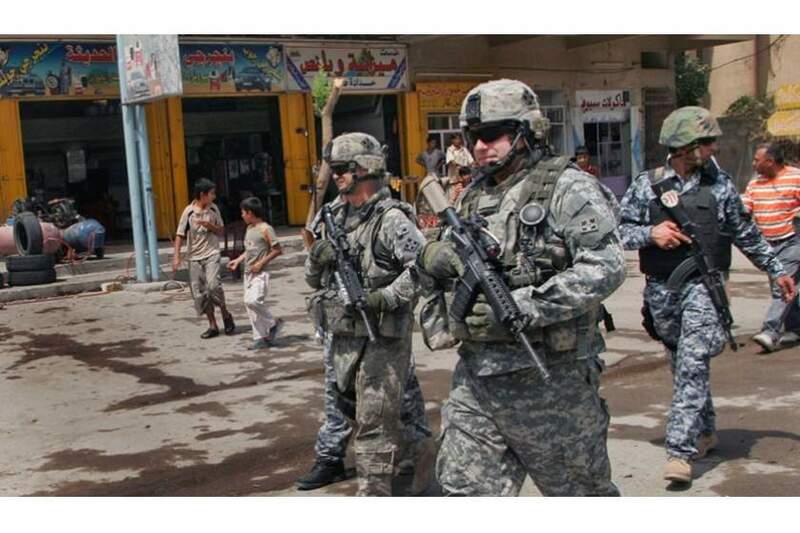 A video has been widely circulated for several days in the media and social media sites, showing the deployment of US forces in the city of Fallujah in Anbar province, and other cities such as the provinces of Salah ud-Din and Nineveh and Erbil. The US Embassy in Baghdad confirmed the presence of 5200 US troops in Iraq, which was met with official denial of these rumours; the spokesman for Baghdad operations said that “the commander of Baghdad operations, Major General Jalil al-Rubaie denies what has been circulated by some media and online about the deployment of US troops in the cities of Iraq,” he added; ” these news are not true” and he said those promoting such information must be accurate and should not spread rumours,” while the council member of Anbar province Eid Ammash Al-Karbouli, confirmed on Sunday, that the presence of US forces on Iraqi territory is in accordance with security agreements concluded “to train Iraqi forces and provide logistical support”. Other reports also said that the reason for the increase of US forces and increase their activity is to counter the Iranian influence and to freeze its 67 militias, and withdraw their weapons and the arrest of their leaders, which has been received with a wave of anger and threats and intimidation of leaders of these militias against this decision, and a welcome of some Sunni forces, that found this move an outlet and a salvation from the hegemony of Iran and the militias on the corners of the state and the army, and its theft of public money, which made the former Prime Minister Haider Abadi in the program “In brief” broadcasted by, “Russia Today”, expressing surprise at the threats issued by different faction, against the existence of American military in Iraq. He said: “They denounce in public and cooperate in secret”! 1- The presence of US forces and its havoc throughout the region and not only in Iraq in fact is a struggle over the areas of influence, to control the capabilities of this Ummah and to plunder its vast oil wealth and to defend American interests. When it says it came to maintain international legitimacy and protect the weak from the strong, it is lying. America, like all other Western countries, adopts the Machiavelli approach, that is, it pretends to be human, moral and just, but in fact it is concerned only for its interests, and for its interests it tramples on humanity, slaughters morality and ridicules justice. 2- Since America came to the land of Iraq, it is taking certain steps in achieving its strategy in the region, the most important is redrawing and structuring of the Sykes-Picot project, and dismantling it, and re-building, and re-drawing its borders again, and move it from the stage of weak states to the stage of the weakest infighting factions, to weaken each other. But their mechanisms vary from time to time and may fail here and there according to events on the ground. But it did not deviate from the main objective that it came for. The movements of US officials and their sudden visit to Iraq indicate that successive Iraqi governments have failed in their ability to implement their plans. They provide many justifications to intervene in Iraq’s internal affairs, like: corruption, failure, poverty, poor services, favouritism, waste of public money, proliferation of weapons and militias and weak security. 3- The open hostile American-Iranian relations does not reflect the true hidden relations based on vital interests that unite the two countries. The general politicians think that Iran is an enemy of America, and think that America wants to strike Iran and weaken it under the pretext of its support for the militias. But most of the political facts indicate the strength of relations between the two countries, as evidenced by the history of relations between them since the revolution of Khomeini until now. The disagreement between America and Iran does not go beyond the media statements. To say that Iran has a uncontrolled role to play in the region is not correct. Iran is moving in the region with the consent of America. It understands the meaning of this process and its limits, even if it raises the tone of the speech to mislead or cover up the truth. Therefore, America sees the regime in Iran as a servant to its interests to a large extent; to the extent that the circles of decision-making in America believes that maintaining the Iranian regime is better than to work to change it.